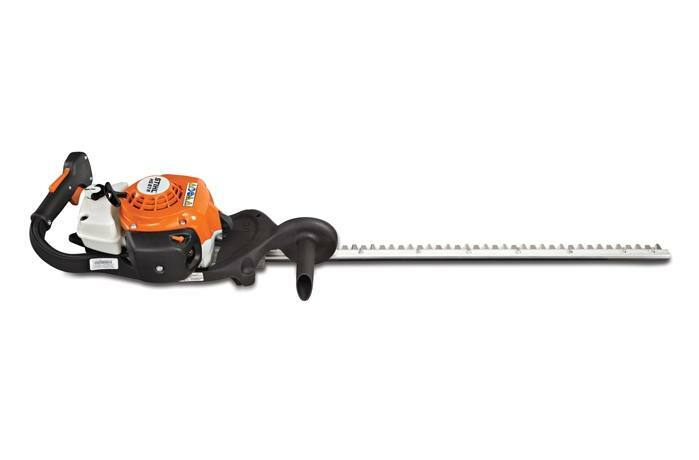 This gasoline-powered hedge trimmer delivers improved fuel efficiency, lighter weight, ergonomic design and increased blade speed when compared to previous models - great for tackling heavy-duty shrub trimming and rejuvenation. The HS 87 R features a single-sided 30" blade, faster blade speed and increased engine torque*, resulting in greater cutting effectiveness and efficiency. It is great for pruning and rejuvenating overgrown shrubs, while its lightweight design is well balanced for easy maneuverability. The “R" indicates a cutting blade designed for thinning, rejuvenation and pruning of thick shrubs and hedges. Its new, low-emission engine uses 20% less fuel than previous models, reducing fuel costs and improving the bottom line. And its low-vibration technology make extended use more comfortable.